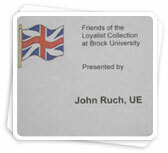 Donations from interested individuals and supporting organizations are the principal source of funding for The Loyalist Collection at Brock University, along with sales of the Butlers Rangers Nominal Roll. To date almost $30000.00 has been raised. Your contribution to this worthwhile project is greatly appreciated, and will be used for the purchase of additional microfilms. For any gift of $10.00 or more a "thank you" letter and income tax receipt will be mailed to the Donor. 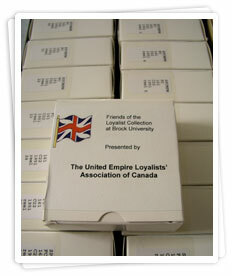 Donations of $25.00 or more may be made as Birthday Gifts, Christmas Gifts, or in Memoriam and will have an appropiate Loyalist card sent. Donations of $100.00 or more will permanently bear the name of the donor, or a name designated by the donor on a box of microfilm held in the collection. 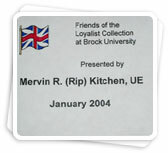 If this is not a Gift or Memorial Donation it may be made directly via computer with your credit card using . If you would like to make an on-line donation click the "PayPal" logo below. A Thank You letter, with your Income Tax Receipt will be mailed to you on receipt of your donation of $10.00 or more. If you have any questions please e-mail. Simply CLICK HERE and we will get back to you promptly.